Stranger Things Eggo Card Game Available Now | Nerd Much? 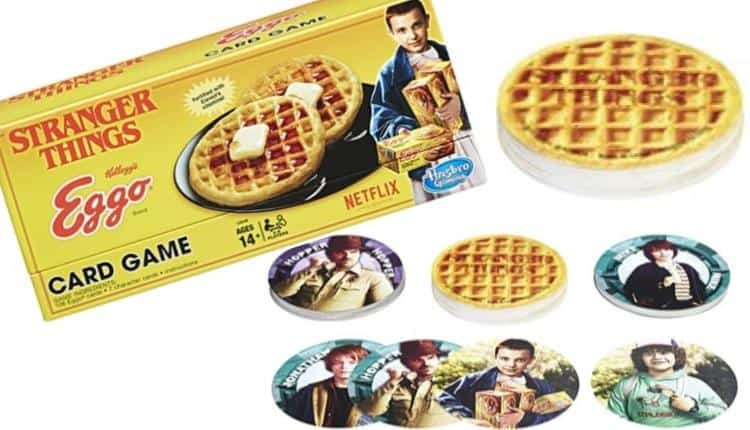 Please keep in mind that these are not real Eggos. If your favorite thing about the show was Eggos, than this Stranger Things Eggo Card Game is for you. It seems like Hasbro watched Stranger Things and thought it would make a great card game, with the words DnD flying right over their heads. That’s alright though, a short card game is a lot less complex than trying to set up an hours long DnD campaign. Keeping the 80s theme of the show, the box for the Stranger Things Eggo Card Game looks to be straight out of the decade. Long ago, when they had to use real photos and couldn’t photo shop them to look absolutely perfect. There’s even a quote saying “fortified with Eleven’s vitamins” with picture of Eleven herself handing a box of Eggos towards you. Don’t be fooled by her sweet smile, this game is not for the faint of heart. Just like the show, this game is rated for ages 14 and up. You can play as any of your favorite characters including Will, Mike, Lucas, Dustin, Eleven, Hopper, and even Barb. This is the complete list of characters, so let’s hope that Barb isn’t destined to die every game. It sounds a lot like Spoons, where everyone is out for themselves and there is absolutely no rescuing one another. Unlike the show, where the characters take every opportunity possible to rescue their friends and loved ones. There’s only been two major character deaths, Bob and Barb, we can only hope that there won’t be more in the upcoming third season. The game contains exactly 106 Eggo cards, 7 characters cards, and instructions. Please keep in mind that these are not real Eggos. Putting these cards in the toaster will only cause a fire and then you’ll have to buy a new toaster.